 Pictorial Customer Installs -U.S.A. The Model 1500 Series Solar Air Heater is a Module Array Assembly for Commercial and Residential application. High Heat output with U.S. Patented "Step Wise Heating Technology™". Custom fabricated ducting for solar air heating. NAT2010 20 inches wide by 32 Long and 5.5 inches deep with New solar air heater profiles makes this collector the most efficient in North America. 7.42 sq/ft collector surface. Fits Double Hung windows. 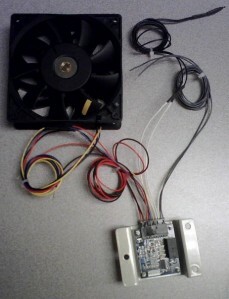 Custom designed fan controller for a solar air heater. This Model rest inside on your window sill and hangs down the side of your building. Installation pictures from solarairsystems.com customers in North America. Step-Wise heating technology™..The Model 1500 Series Solar Air Heater is a Module Array Assembly for Commercial and Residential application. High Heat output with U.S. Patented "Step Wise Heating Technology™".